GrainFlux 3 is Now Available! Today we are releasing a brand new update for GrainFlux, our Max for Live hybrid synthesizer. The new version 3 includes a complete re-design, major changes to the sound engine and many new features and improvements. GrainFlux is a synthesizer we first released back in 2014 that combines techniques from granular, wavetable and subtractive synthesis to create unique sounds and textures. What makes GrainFlux stand apart from other synthesizers is that it uses a completely unique approach to those synthesis techniques and offers the user controls that are now available on any other synthesizers. For this new 3.0 update, we decided to improve upon it’s core ideas and add more features to make it more flexible. The sound engine was completely designed and now sounds better than ever which allows GrainFlux to make everything from very subtle leads to extremely aggressive basses. Amongst the new features, we’ve added a new Motion section that allows the user to scan through audio files to create everything from evolving waveforms to time stretched loops, new envelope follower mode for Env 1, and a new All Pass filter (which works great when combined with the Feedback fx). Because of these new changes, GrainFlux is now also a great tool for artists looks for new ways to experiment with different types of synthesis in a very unique way. The new Version 3 is also a free upgrade for all existing GrainFlux customers. If you’ve already purchased a copy, check your email inbox for a new download link! If you'd like to keep up with our latest releases and projects, make sure to follow us on Twitter (@SpektroAudio), Instagram (@SpektroAudio) and on Facebook (/SpektroAudio). ACDGEN 1.2 is Now Available! The holidays are almost here but we were still working hard this week to finish and release one more update for ACDGEN before 2019! The new ACDGEN 1.2 update is now available and it includes new features, improvements and bug fixes. For those who don’t know, ACDGEN is a Max for Live advanced pattern generator designed to create 16th note, acid-style basslines and melodies via 8 different algorithms. You can also control up to 4 instances of ACDGEN from the Ableton Push 2 via the included ACDBRAIN device. Our main goal for this new update was to include features that users have been requested as well as some improvements to make the device more useful and flexible. New Arp3 algorithm – The new Arp3 algorithm combines ideas from classic arpeggiators and other ACDGEN algorithms to create mode dynamic and interesting arp-like melodies. New Note Display – ACDGEN can now display activate step, note velocity and density state. Added 4 new presets for the main Transpose and Length tab buttons. Added new option to enable or disable the Post Quantizer. Key and Scale parameters now work in real time and can now be midi mapped. Pattern display now properly updates according to the sequence length. Improved Push 2 support: added controls for the Key, Scale, Restore and Export to MIDI parameters. Fixed a bug that would cause the Swing and the Pattern Shifter to output doubled notes in certain situations. ACDBrain Quandrant selector is now available in the Options view. Settings tab was renamed to Main. The new ACDGEN 1.2 update is free for all existing customers and new download links will be sent via email. ACDGEN 1.1 is Now Available! The new 1.1 update for ACDGEN is now available and it includes a new complementary device, better integration for the Ableton Push 2, and some important bug fixes. Our focus for this new update was to make ACDGEN even better for live performances and studio jam sessions therefore we’ve developed a new complementary Max for Live device called ACDBRAIN, a free add-on for ACDGEN which allows the user to control up to 4 instances of ACDGEN from the Push 2’s User mode. Because it uses the User mode, the user can switch between the Push’s regular functionality and ACDGEN at any moment by clicking on the User button. Button layout for each of the 4 quadrants in ACDBRAIN. ACDBRAIN divides the Push 2 grid into 4 quadrants and each instance of ACDGEN can be assigned to one of those quadrants. The 16 buttons available on each quadrant control length, transposition, variations, density and pattern generation according to the diagram on the right. Each quadrant can also be assigned to different colors to make it easier for users to visually associate them with the different instruments / instances. ACDBRAIN uses the open-source AP2JS script that we’ve developed for the Push 2. AP2JS is available at https://github.com/SpektroAudio/AP2JS. Because ACDBRAIN and the new Push 2 integration were designed using new changes to the Max for Live APIs, Ableton Live 10 is required (ACDGEN will continue to work in Live 9 except for these new integrations). Patterns can now be generated via the Push 2’s 1/32t button (will light up green when track is selected). MIDI Export now works when the device is grouped. Note lengths on export MIDI clips now properly match the generated patterns. While this release focuses on the Push 2, we hope to add support for the Push 1 and other controllers in future updates. The new 1.1 update and the ACDBRAIN devices are free for all existing ACDGEN customers (new download links will be sent via email). ACDGEN 1.0 is Now Available! Today we're excited to release a brand new product: ACDGEN! 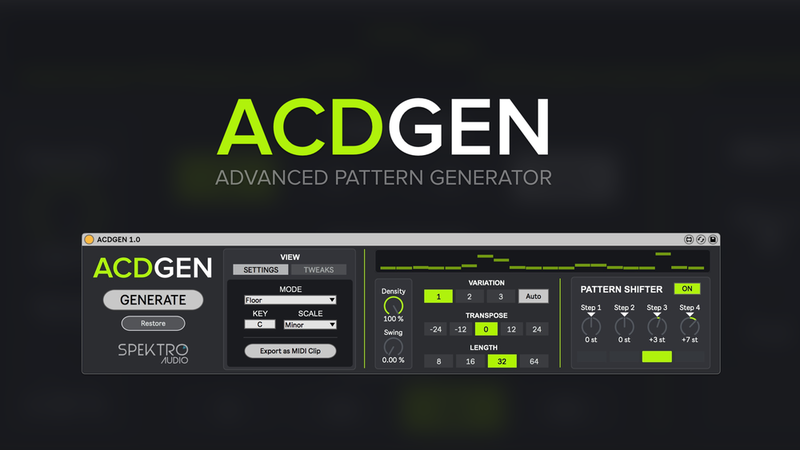 ACDGEN is a Max for Live advanced pattern generator designed to create 16th note, acid-style basslines and melodies. It features an easy to use interface, 7 different modes / algorithms, automatic pattern variations, non-destructive pattern manipulation, pattern shifting, advanced settings (Tweaks) and the ability to save generated patterns as MIDI clips. While working on my own live set for the past 3 years, I came accross many different bassline / melody generators (such as Skinnerbox's STING) however I always felt that they lacked certain features that I believe would be incredibly helpful when playing live therefore I decided to work on my own solution. My goal for ACDGEN was to create a device that can generate really good results, help me do more while playing live, and is easy and fun to use to use live but also has enough depth to be used in studio. ACDGEN uses 7 different algorithms to generate it's patterns. Here's a brief description of each one of them. - Normal: a simple and straight-forward random algorithm. - Floor: uses a smaller selection of notes and has a higher probability of playing the fundamental / base note (great for basslines). - FifthOct: limits the note selection to the fundamental / base note and it's fifth. - Upwards & Downwards: generated a sequencer that tends to go up or down in the selected scale. - Up-Stepped & Down-Stepped: similar to Upwards and Downwards but it can also alternate between higher / lower notes and the fundamental / base note. The device also includes other powerful features such as a Pattern Shifter (a 4-step sequencer designed to transpose the entire pattern), the ability to automatically generate and switch between different variations of the main pattern, a Restore button to revert to the previously generated pattern, a Pattern visualizer, and more. While ACDGEN was designed to be an incredible tool for live performances, it can also be used in studio. Features like the Tweaks view (which lets you tweak how the pattern generator works and influence the different algorithms) and the ability to export the generated patterns as MIDI clips are great when using ACDGEN for music production. I believe ACDGEN is a great tool for electronic musicians who are looking to improve their live setup or new ways to get inspired when working on their next songs. If you'd like to keep up with our latest releases and projects, feel free to follow us on Twitter (@SpektroAudio), Instagram (@SpektroAudio) and on Facebook (/SpektroAudio). Fragments 1.2 is now available! We're excited to announce that the new 1.2 update for Fragments is now available and includes some great new features and improvements! Live Input processing*: Fragments can now be used as an audio effect / processor. To use this mode, route any audio track to the Fragment's track and set it to Live Input mode. Because Fragments runs in a MIDI track, you can still trigger each of the 8 voices via MIDI even while using the Live Input mode. Free running LFO: you can now disable the sync for the LFO and set it to any frequency between 0 and 20 Hz. Tempo-synced delays: the delay times can now be set to clock divisions (1/2 to 1/128 note). Wider range for motion time divisions: Motion rate can now be set up to 4 bars. Added Dry / Wet parameter (only available in Live Input mode). Fragment's window now remains always on top while opened. Renamed the Delay Feedback pararameter to Delay FB/Mix. * Ableton Live 10 (or newer) is required for Live Input processing due to new changes that were recently added to the Max for Live API. Existing Fragments customers will receive a download link for the new update via e-mail. Fragments is a Max for Live granular synthesizer designed to generate glitched and percussive loops. It's available for U$19.99 at http://spektroaudio.com/fragments. Fragments 1.1 is now available! Today we're releasing the brand new 1.1 update for Fragments, our Max for Live granular synthesizer! - New Sequence Storage feature: quickly store and recall up to 9 different sequences. - New Voices section: mute and trigger any of the 8 granular voices. The Voices section also include a new Flip button that can be used to solo voices (flip all to on and turn mute off for the voice you'd like to solo) or to creatively switch between 2 sets of voices. - New Auto Randomizer: randomize all parameters automatically. • RST: click to reset all 8 sliders to their default value. • Global Randomizer: disable to prevent the parameter from being randomized by the Auto Randomizer and the "Randomize All" button. - Minor bug fixes and design changes. Existing customers will receive a new download link for the new update via email. To celebrate the release of Fragments 1.1 and the holiday season, we're offering a 20% discount for any of our products. To take advantage of this offer, add any products to your cart and use the coupon code FRAGMENTS11 at checkout. This offer is valid until December 31th, 2017. Nucleation mk2 1.1 is now available! 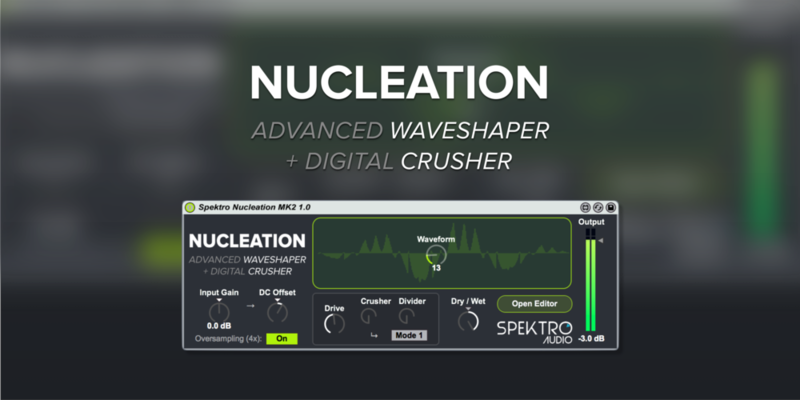 The new Nucleation mk2 1.1 update is now available and it adds great new features and improvements to our wave-shaping and bit crushing Max for Live device such as a re-designed DSP engine, 2 new wave-shaping modes, Timbre parameter, and more. Nucleation now sounds more organic and precise due to it's re-designed DSP engine. High Def: New high quality mode which generates more organic and hamonically rich timbres. Classic: Replicates the grittier and harsher sound of Nucleation mk2 1.0. Lo-Fi: Uses a lower quality waveform to generate timbres that sound more digital and old-school. New built-in Compressor that reduces the dynamic range of incoming signals. New Timbre parameter that changes the sound by adding extra harmonics. The DC-Offset parameter now shows values in percentage (0 to 100%). The Drive knob no longer generates artifacts when automated / modulated. Minor changes to the design of the device. The 1.1 update for Nucleation mk2 is free for existing customers. If you've already purchased a copy of Nucleation mk2, check your email inbox for a download link for the new version. To keep up with our latest news, make sure to follow us on Twitter, Facebook and Instagram. Today we're releasing a brand new Max for Live device called Fragments. Fragments is a granular synthesizer that can generate 8 different voices that can be sequenced to generate glitch loops. Because of it's granular engine, Fragments will have a completely different sound depending on the sample loaded into it's buffer. Fragments also includes some amazing features such as randomizers (global and individual per parameter), a modulation source that can be used to control different parts of the granular engine, and a Motion feature that lets you shuffle the value of a specific parameter between the 8 granular voices. We designed Fragments to be intuitive and fun to use. Simply load any audio sample, press play on Live and start editing and randomizing the different parameters. 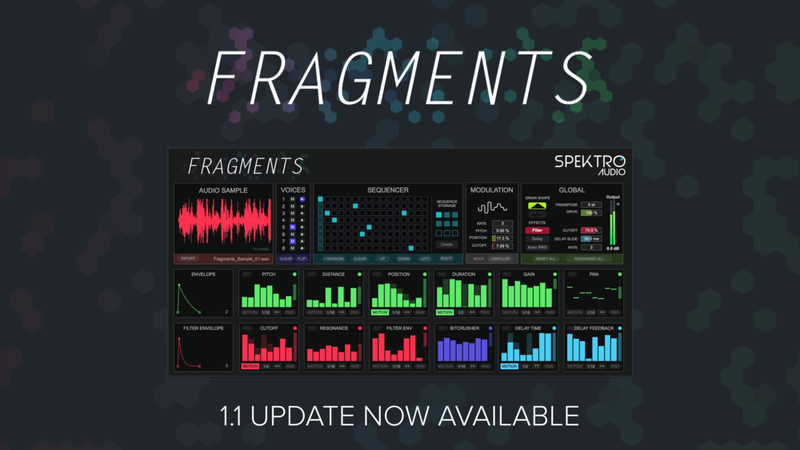 Fragments is available for U$19.99 at http://spektroaudio.com/fragments. If you'd like to keep up with our latest projects and releases, make sure to follow us on Twitter and on Instagram (@SpektroAudio). The first version of the CV Toolkit Max for Live device (prior to the Standalone Version). Three years ago we release one of our first Max for Live devices: CV Toolkit. The idea for this device was to have a simple control voltage generator capable of creating some basic modulation signals such as LFOs, random voltages and envelopes. We were so excited about this device that, in order to expand the idea further, we had to turn it into a proper standalone piece of software. This is basically the TL:DL story of CV Toolkit Standalone Version. CV Toolkit Standalone Version became so much more powerful than it's Max for Live counterpart that we stopped working and updating the M4L device. This decision eventually led to confusion since many users would see 2 products / projects that shared the exact same name and were completely different from one another (free vs paid, simple vs powerful, 2013 vs 2016). After thinking about this situation for a while, we decided to remove the old CV Toolkit Max for Live device and work on a completely new device: CV Toolkit Mini. Our goal for CV Toolkit Mini was to bring the design and workflow of CV Toolkit 2 into a simple yet quite powerful M4L device. CV Toolkit Mini includes a Clock Generator, an LFO, a S&H, 2 envelopes (AD and ASR), a multiplier, an offset generator, 2 oscilloscopes (for the 2 outputs), and, of course, a mini routing matrix. Using these features you can clock, modulate and control your modular synthesizers in many different ways, specially once you start combining these modules in different ways using the routing matrix. We also added a protection mechanism that uses the Live API to prevent the device from sending DC signals to your main speakers. While our business goal for CV Toolkit Mini is to promote the more powerful CV Toolkit 2 Standalone version, we are happy to give back to the community a device that is useful, powerful, elegant, and fun to use and explore. The download includes the Max for Live device and 10 presets to get your started. If you'd like to support our work, make sure to check out CV Toolkit 2 and our other Max for Live projects. Today we're releasing Distribute, a brand new Max for Live device that is designed to improve the workflow of working with multi-channel plugins in Ableton Live. Our main goal for Distribute was to remove the hassle of working with multi-channel plugins such as Drum Machines (like Arturia's Spark and D16's Drumazon), Samplers (like Native Instrument's Kontakt) and even Multi-Timbral Synthesizers (like Reaktor). Instead of having to manually create additional audio outputs and MIDI inputs for your plugins, you can use Distribute to automatically create, rename and route as many additional tracks as you need. Version 1.0 also includes options for creating a bus track and changing the pattern that it uses for naming the additional tracks it creates. Distribute will help you save time and CPU power by automating the process of working with multi-channel plugins so you can use fewer instances of the same plugins. Distribute is available for U$9.99 at http://spektroaudio.com/distribute. As always, don't forget to follow us on Twitter (@SpektroAudio) and on Instagram (@SpektroAudio as well). Nucleation MK2 is now available! We are excited to announce that the new Nucleation MK2 Max for Live device is now available! Nucleation was the first device we ever released and it combines wave-shaping and digital distortion into a single device. The new MK2 version includes many new features and removes many of the friction points that existed in the previous versions. Since the first version was released more than 2 years ago, we decided to re-design and re-write Nucleation from scratch. Check out the overview video for this new version! One of the best new features of the new MK2 is that it completely removes the need for WAV files that were previously used as the indexes for the wave-shaper and, instead, it generates these waveforms on the fly based on the Editor parameters and presets. This new mechanism also allow users to directly manipulate and edit the waveforms using the built-in editor. The new editor was designed to be easy and fun to use. To create your own waveforms, you can use the Waveform Mixer to mix between the 6 pre-generated waveforms and then use the Waveform Effects to further manipulate the waveform. You can also store your custom waves to your user bank to use it in future projects. MK2 not only sounds great but it also includes many other new features such as Drive, 2 completely new digital distortion algorithms and 4x Oversampling mode. Existing MK1 customers will receive a coupon code via email for a special upgrade price! If you'd like to know more about our future projects, don't forget to follow us on Twitter and on Instagram! GrainFlux 2.0 is now available! The new 2.0 update for GrainFlux, our granular / hybrid Max for Live synthesizer, is now available and it includes new features, enhancements and bug fixes! Our goal for this new update was to take GrainFlux to the next level and add new features (such as the new modes, Center parameter, Multi-Stage envelope, Filter FM, etc) that would allow the user to create even more interesting timbres and sounds. • 6 new modes: Regular, Inverted, Alternate, Ringmod, Min/Max and Max/Min. ↳ Regular: Wave 1 and Wave 2 are mixed together normally. ↳ Inverted: Wave 1 and 2 are mixed together while Wave 2’s phase is flipped 180º. ↳ Alternate: Alternates between Wave 1 and Wave 2. ↳ RingMod: Wave 1 is multiplied by Wave 2. ↳ Max/Min: positive part from Wave 1 + negative part from Wave 2. ↳ Min/Max: negative part of Wave 1 + positive part from Wave 2. • New Center parameter: modifies how the modes operate in different ways depending on the mode. • Added a new Multi-Env mode to Envelopes 1 and 2. The user has the option to select which mode he/she would like for each of the envelopes independently (ADSR or Multi-Env). • New post-VCA effect: Karplus. Karplus uses the a very short delay line that can be used to add subtle reflections or a longer metallic “tail” to the sound. • Added enhancements to LFO: new Phase, Reset, and Shape controls. • Re-designed Filter modulation engine to be more flexible and precise. • Added Filter FM with selectable modulation source (Bass Oscillator or Grain Wave). • Added MIDI Velocity as a modulation source for the Filter’s Cutoff. • Fixed the range and scale of the Bass Boost and Grain Wave knobs to work in dB (instead of linear gain). • Changed the scale of all Modulation knobs as well as the Pre-Drive and Feedback knobs to 0-100%. As usual, existing GrainFlux customers will receive the new 2.0 update for free via email (keep an eye on your inboxes!). GrainFlux is available for U$14.99 at http://spektroaudio.com/grainflux. We're extremely proud to finally announce that our first artist collaboration is now available: Sonic Mayhem's Doomsday – Producers Edition. Doomsday is Sonic Mayhem's debut album and the Producers Edition adds many useful tools for composers, sound designers and produces. During the creation of Doomsday, we worked together with Sascha Dikiciyan aka Sonic Mayhem to create an exclusive Kontakt library and 2 brand new Max for Live devices for the Producers Edition. The Kontakt library includes drums, bass and lead instruments which were carefully sampled from Sonic Mayhem's own setup. Most of these instruments were created using his incredible Eurorack modular synthesizer. All the Kontakt patches included in the Producers Edition feature a special interface which lets the user fine tune the sound to their own needs. We also worked with Sascha to create two exclusive Max for Live devices for Doomsday: the OmegaSEQ and the AlphaDTR. The OmegaSEQ is an 8-step sequencer and it let's the user record 8 notes using any MIDI controller. When set to Play mode the user will be able to play the original recorded sequence by playing the note C3. All the other notes will play and transpose the sequence according to the note interval between the note played and C3. In other words, D3 will transpose by 2 semitone, C4 will transpose by 12 semitones and so on. OmegaSEQ also includes 2 very interesting features: a velocity sequencer and the Tension knob. The velocity sequencer offers an easy and quick way to edit the MIDI velocity of all the 8 steps. It also features a smart random button which creates different rhythmic sequences. The Tension knob is useful for creating build-ups without having to automate the internal parameters of your synthesizers. It works by increasing the velocity and gate length of all the steps while decreasing the swing amount. 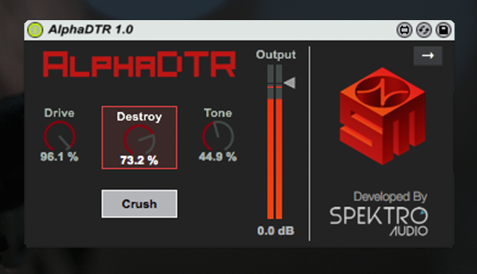 The AlphaDTR is an audio effect focused on distortion. It uses a combination of a distortion circuit (based on chebyshev polynomials) and a bit-crusher to distort and destroy everything your send to it, Doomsday style. While AlphaDTR's main interface consists of only 3 easy-to-use parameters, the user also has the option to open the advanced settings for more granular control over each parameters. Both Max for Live devices and the Kontakt library were created exclusively for Doomsday and were created with the same care as all our other products. We're extremely proud to be part of this amazing project and to have it as our first ever artist collaboration. The Doomsday Producers Edition is available exclusively at http://doomsday.sonicmayhem.com. 2014 was a great year for Spektro Audio. We worked on some great projects and we received a lot of support from our costumers, audio / music related websites and professionals from all over the world. The first version of CV Toolkit - Standalone Version was released in Janurary and it was greatly received by the modular synth community. CV Toolkit - Standalone Version 1.0 was reviewed by Resident Advisor and it received a 4/5 score. Since the first release, our goal for CV Toolkit has been to offer an incedibly flexible, easy to use and affordable solution. Throughout the year, we released the 1.1 update that added important features such as VCO Calibration and a CV Quantizer, and the 1.2 update that introduced the new Virtual Slot System and four new virtual modules. Interface changes from the first 1.0 release to the latest 1.2 update. Many professionals in the audio / music community such as Richard Devine, Sonic Mayhem, Cyrus Rex, Celldweller, Brent Daniels and many others have shown their support for CV Toolkit. Our plan for 2015 is to continue to improve and expand CV Toolkit and even add support to other products (more about that in the near future!). This year we also released an amazing new Max for Live synthesizers called GrainFlux and a new 1.1 update for Komplex. GrainFlux is a monophonic virtual synthesizer that combines different synthesis techniques such as granular, wavetable, and subtractive synthesis to create unique and distinctive sounds. It uses audio samples to create different waveforms which can be morphed and modulated. If you'd like to know more about GrainFlux, visit http://www.spektroaudio.com/grainflux and check out the audio demos and video overview. We also released a new 1.1 update for Komplex, our FM-based Max for Live synth. The 1.1 update added polyphony, adjustable envelope curves and many other minor enhancements. For more information about Komplex 1.1, visit http://spektroaudio.com/komplex. In 2014, we decided to give back to the community by offering free projects such as the Wired Bass instrument pack for Ableton (which was featured on Create Digital Music and has had more than 5.000 downloads) and the Spektro PS-8, a free MaxforLive sequencer for the Ableton Push. We'd like to thank everybody for their continuous support and assure you that we'll continue to work hard to offer great new products and updates during 2015. If you'd like to keep up with our latest announcements, follow us on Twitter (@SpektroAudio) and on Instagram (@SpektroAudio as well). We're proud to announce that GrainFlux, our latest MaxforLive synthesizer, is now available! GrainFlux is a monophonic MaxforLive synthesizer that combines different synthesis techniques such as granular, wavetable, and subtractive to create unique and distinctive sounds. It works by using audio samples to create two different waveforms which can be morphed and modulated. While you can use any of your own samples, GrainFlux ships with 40 high-quality samples created using a Eurorack modular synthesizer to get you started. These samples were designed to give you a variety of different timbres and textures. What sets GrainFlux apart from regular granular synthesizers is that it uses 2 separate and different grains which can be controlled independently. We developed some great and unique features such as the Tilt control, that lets you simultaneously change the grain size of the two waveforms in opposite directions. Since GrainFlux uses samples to create these waveforms, you can easily get completely different timbres and sounds by simply loading a different sample. Our goal when designing this synth was to mix different synthesis ideas in a way that could provide powerful results while still being easy and fun to use. Everything in GrainFlux, from the default settings to the way modulation works, was carefully thought out so you can get very interesting timbres even from the most basic patches. The interface was designed to make artists feel comfortable to experiment and play around without making them feel overwhelmed by too many controls and settings. We also focused on providing a great and fast workflow. For example, when you drag an audio sample onto the Audio File drop-box, GrainFlux automatically updates the Folder drop-down menu to display all of the other audio files available in that same folder, so you can quickly try different samples. If you'd like to keep up with our latest news, follow us on Twitter (@SpektroAudio) or sign up for our newsletter. We're thrilled to announce that Spektro DRG, our new product, is now available! DRG or Dual Rhythm Generator is a Max for Live device capable of generating clocks and rhythms that can be used with analog synthesizers and drum machines via control voltage. It's a great solution for syncing your analog / modular synthesizers to Ableton Live. Like all our cv-related products, DRG also requires an audio interface with DC-coupled outputs or an Expert Sleepers module. While testing the beta versions, we realized that DRG could be used in many different ways such as for clocking analog sequencers, sequencing drum modules, triggering envelope generators and clocking time-based function generators (such as the 4ms Pingable Envelope Generator and the Mutable Instruments Tides). We worked hard to make DRG flexible enough to be used in different situations. The workflow was thought out to work great both in the studio and in live concerts. Everything on the front panel, from the simple layout to the LEDs colors, was design to give you instant feedback of whats going on. Features such as the MIDI Controlled Presets let's you add variation to your track and change the settings using either MIDI clips or any MIDI controller. If you'd like to know more about DRG, visit http://spektroaudio.com/drg. What's coming in the Komplex 1.1 update! After releasing the CV Toolkit 1.1 update, we decided to work on an update to one of our most popular MaxforLive devices, Komplex. Komplex was released back in October of 2013 as a monophonic synthesizer based on the Buchla 261e module. After receiving a lot of feedback from our customers, we decided that, for this 1.1 update, we wanted to work on improvements rather than on new features. • Improvements to the Wave Morph section – morphing between the 3 waveforms sounds a lot smoother. • Improvements to the 3 ADSR E.G.s – adjustable curves (Log - Lin - Expo) and equivalent ranges to all 3 E.G.s. • Improved FM section - we've fixed some issued related to the FM section and the modulating wave's phase. • Minor design improvements to improve usability. Although we didn't add many new features to this update, we re-designed the core of this device in order to greatly improve the overall sound of the synth. The Komplex 1.1 update will be a free update and we're planning on releasing it very soon. If you'd like to know more about this update, follow us on Twitter (@SpektroAudio). Spektro Nucleation 2.0 is out! Great news everybody: Spektro Nucleation 2.0 is out! • gen~ processing: During versions 1.0x, Nucleation, like most MaxforLive devices, processed sound in blocks of samples. Now, in version 2.0, it upsamples the signal by 2x and then uses the gen~ technology to process sample-by-sample! This new processing method results in less digital artifacts, less aliasing and a more pleasing timbre for your sound. • New controls for you to shape your sound even further: offset and shift! Even tho the Offset control already existed in the previous versions, it now works differently due to the new gen~ processing method. The new Shift control allows you to shift the waveform forward in time, completely changing the sound. If you've already bought Nucleation in the past, check your email for a download link. We're really excited about this new version and we hope you guys have fun with it! Here's a video demo / preview of the Spektro Nucleation upcoming 2.0 update that we'll be releasing very soon. The 2.0 update uses the gen~ technology to process sound sample-by-sample. This new processing method results in less digital artifacts, less aliasing and a more pleasing timbre for your sound. There are 2 new controls for you to shape your sound even further: offset and shift! Even tho the Offset control already existed in the previous versions, it now works differently due to the new gen~ processing method. The new Shift control allows you to shift the waveform forward in time, completely changing the sound. For further information, check out http://spektroaudio.com/nucleation. CV Toolkit 2.8 is now available! Mod7 pack and CV Toolkit 2.6.1 update are now available! CV Toolkit 2.6 is now Available! Spektro Audio is a sound design and music production company based in São Paulo, Brazil.